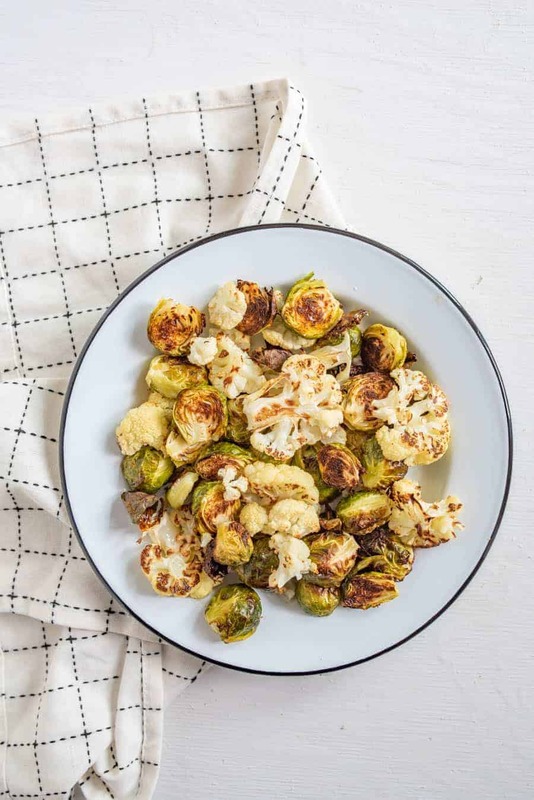 This Roasted Brussels Sprouts and Cauliflower recipe is one of our all-time favorite healthy vegetable side dishes that the whole family loves to eat. Roasting vegetables turns them into vegetable candy. I’m not even kidding; this is the secret way to cook vegetables that will have even your kids begging for more. The high temperature brings out a natural sweetness. Oven roasting also produces a tender, yet non-mushy vegetable, plus it couldn’t be easier. A little oil, salt and pepper, and fresh lemon are all that you need to turn a simple vegetable into the star of the meal. Looking for an easy way to round out a meal or a healthy option to add to the table at dinner? Roasted veggies are the way to go. 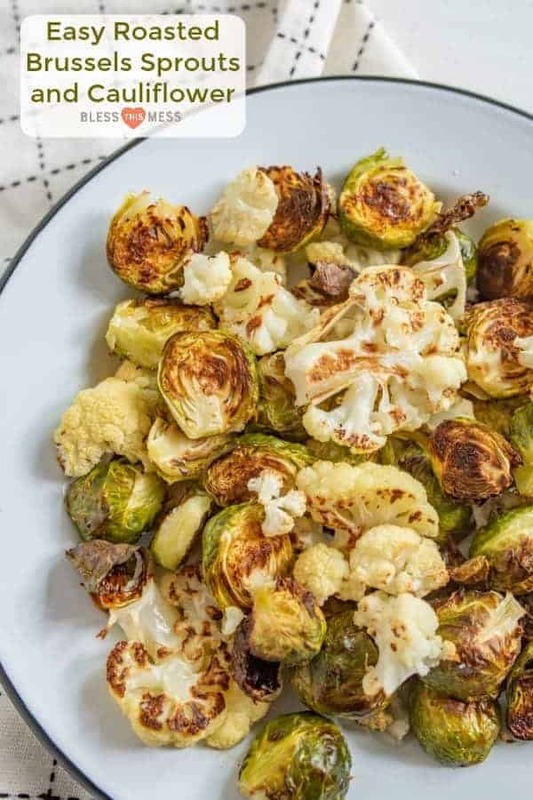 Not a fan of either Brussels sprouts or cauliflower? I’m here to convert you to both and this cooking method is the key. I can’t wait for you to try it. Look for Brussels sprouts that are about two inches long and are bright green with no dark blemishes. Feel free to use another neutral oil for this recipe if you prefer. If you don’t have the lemon, don’t stress it. It’s great on it but they’re good without it, too. I swear by this enamel baking sheet. Bakes up evenly and cleans up so well! So pretty you can serve off of it. How do you make crispy Brussels sprouts? 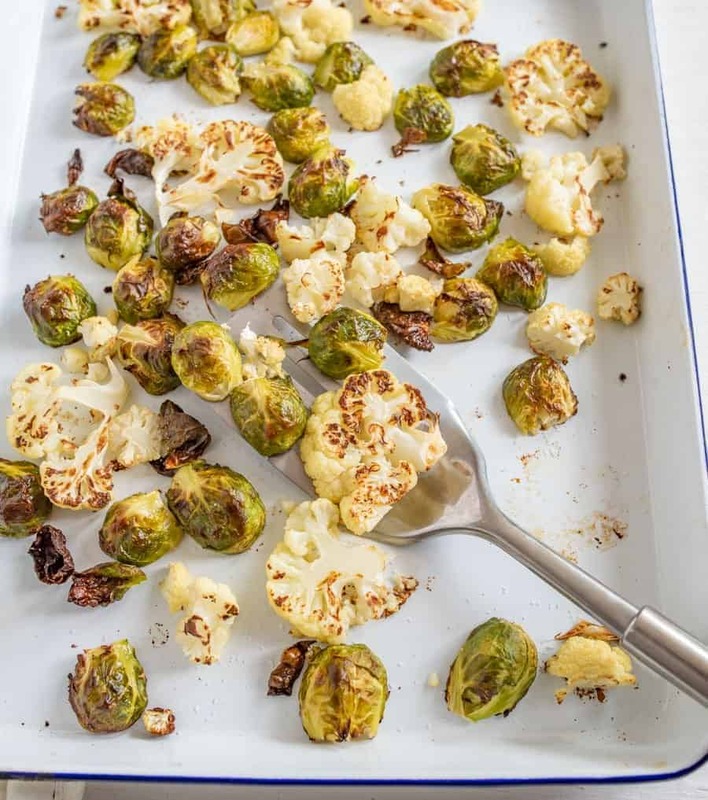 The key to super crisp veggies is to roast them in a really hot oven and do not line the pan they are baked in. I repeat – don’t line your pan with anything if you are after that golden crust that comes from roasting. Direct contact with your hot pan is the secret to that golden brown edge on your vegetables. 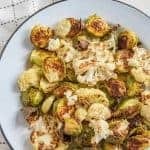 What can I make for dinner with cauliflower and Brussels sprouts? Pick a simple protein I have listed, add the veggies, and top it off with a carb like a perfect baked potato or some easy no-knead bread and you have the makings of one delicious meal! 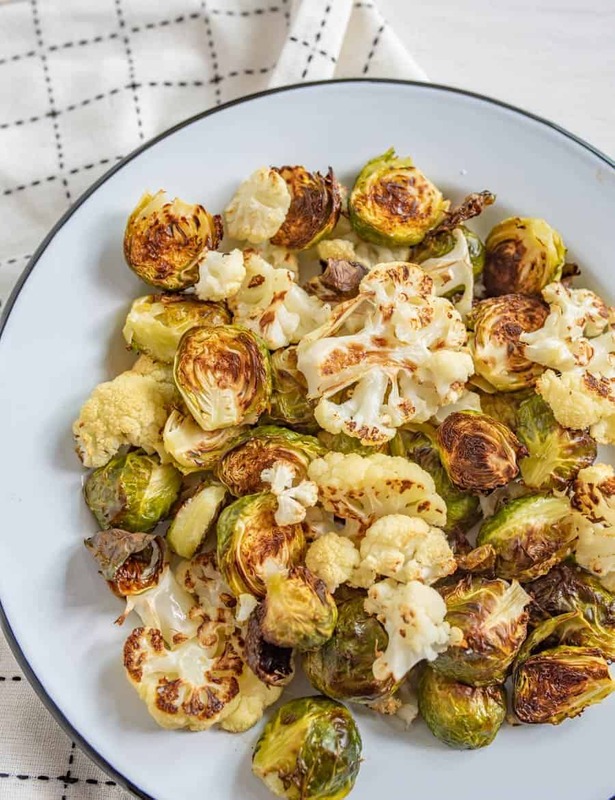 Roasted Brussels Sprouts and Cauliflower is one of our all-time favorite healthy vegetable side dishes that the whole family loves to eat. In a large bowl, add the veggies and drizzle the olive oil over the top. Sprinkle on salt and pepper. Toss to coat. Spread the veggies out on a baking sheet, flipping the Brussels sprouts over as needed so that the cut side is down. 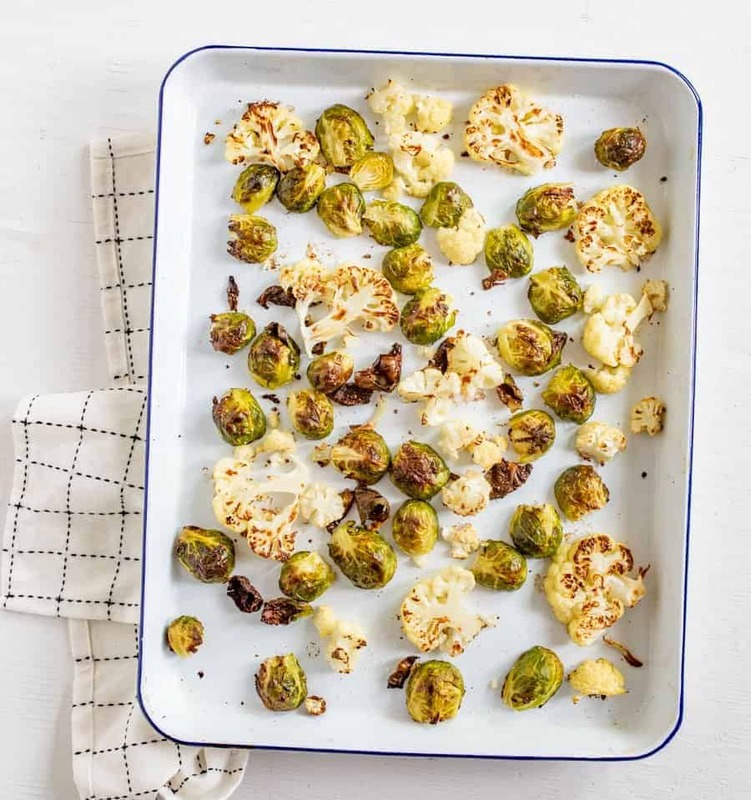 Bake in hot oven for 15-20 minutes until you can pierce the Brussels spouts with a fork. When they come out of the oven, squeeze the lemon over the top. Serve right away with more salt and pepper to taste. Some of the simple recipes are just the best, aren’t they? This is one that you’ll make over and over again and never tire of. Enjoy from my kitchen to yours. This recipes is an oldie but goodie and was originally published in 2012 and has been updated, rephotographed, and republished in January 2019. I love roasted veggie, but have never tried roasting beets. Do you just slice them up, or do you peel them first? I peel mine! The outside is pretty tough. Other than that, it’s just the same. They are so so sweet when roasted!